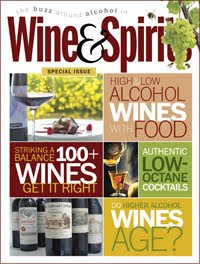 So far I've only sat on Wine & Spirits magazine's tasting panel once, and maybe by blogging about it I won't be invited back. But I found their procedure interesting so I'm going to describe it. Joshua Greene, editor and publisher, invited me to sit in on a winnowing panel for California wines that the magazine received only one bottle of, instead of the two they requested. Publications like to ask for two bottles not only in case one is corked, but also so they can take notes at two different times. On these wines, Greene -- who wrote the article about them -- had only one shot. What Wine & Spirits does is convene a panel of 5 professional tasters, in this case Greene and another W&S employee along with me, a wine buyer and a sommelier. We tasted blind; Greene hires a guy (apparently a restaurant waiter) for a couple hours to come in and pour the glasses. If a wine got three votes, it made the magazine -- even if Greene didn't like it. In a few cases, when he was one of only two people who liked a wine, he cajoled us until he got a third vote. But generally I was surprised by how little power he exercised, though I wasn't there when he wrote the reviews. Most US wine publications use the one-taster system. James Laube decides on which California Chardonnays he likes, and those are the ones Wine Spectator recommends. Greene was surprisingly open to others' choices. This is the system we used at the San Francisco Chronicle when I was there, and I like it. Wine is so subjective; on 10 of the 33 wines I disagreed with the group's decision. Was I wrong, or were the other 4 tasters? The answer is neither. However, the point scores are all Greene's decision. We could outvote him to get a wine on the list, but we couldn't make him give it 93 points. 22 of the 33 wines were expensive Chardonnays, with an average price of $43. How many $43 Chardonnays, out of 22, would you expect a panel to consider good enough to recommend? We chose 7; I think that's low, considering the price. There also wasn't one Chardonnay that we all agreed was fantastic (though Hanzell Sonoma Valley Chardonnay 2007 came closest). Was that because we didn't have top quality brands to taste? No -- we had wines from Au Bon Climat, Lioco, Nickel & Nickel, Ramey, Rochioli, Stony Hill, Williams Selyem and others. It wasn't the region -- we had 11 appellations -- or style either. Only a couple of wines were awful in the mid-'90s buttery style (if you like that, Stag's Leap Wine Cellars made one like buttered popcorn). My conclusion isn't a new one: pricey California Chardonnay is a "crapshoot," with still enough good wines to merit that second syllable. Another observation: I think I'm a fan of "natural wines," made from indigenous yeast with low-impact winemaking, because they tend to have more complexity. But in a blind tasting, they showed poorly. I thought an Arnot-Roberts Chardonnay tasted like lemon-cherry lipstick (on the plus side, it did bring back the thrill of kissing when I was 17). One Lioco Chardonnay was too funky for me; had I known what it was, I might have tried harder to get past the aroma. Does that show the strength of blind tasting, or its weakness? I'm not sure. In a real-life situation, I might have ordered the Lioco, a brand I admire, and spent the whole glass or bottle debating its merits. It might have evolved in the glass. However, I would also have run into the psychological power of brand expectation, which would have caused me to like it more than it deserves. Hanzell Sonoma Valley Chardonnay 2007 ($70): I hate it when the most expensive wine is my favorite, but that's the case here. Lemon fruit so bright that it has something of a Pez quality, but pretty floral notes remind you why you're here. Would be great with white-flesh fish, or just sitting on the porch in twilight. Varner Bee Block Spring Ridge Vineyard Santa Cruz Mountains Chardonnay 2008 ($39): Delightful nose that's like a toasty lemon creme brulee. Good toast and lemon flavors, though very slightly hot on the finish. At the end of the tasting, there were 33 half-full bottles of wine sitting around -- expensive, famous wines. Josh offered me my choice of the Chardonnays that I had liked which the group hadn't; this included a Williams Selyem and a Ramey. But I passed, and nobody else took home a bottle either. Lots of $50 Chardonnay went down the drain that day. Were there any corked bottles? Did you keep that score? this tasting tells me that California Wines aren't as good as everyone thinks they are and they are way over priced. Try Washington Chardonnay's at half the price and twice the Quality. We had one corked bottle out of 33. We did not recommend that wine.